Orange County Mayor Teresa Jacobs’ fourth annual Holiday Heroes Toy Drive exceeded goal expectations collecting 4,655 toys. The toys were sorted and donated to Orange County Neighborhood Centers for Families, Orange County Public Schools, Wraparound Orange, the Community Food and Outreach Center, Toys for Tots and the American Red Cross. 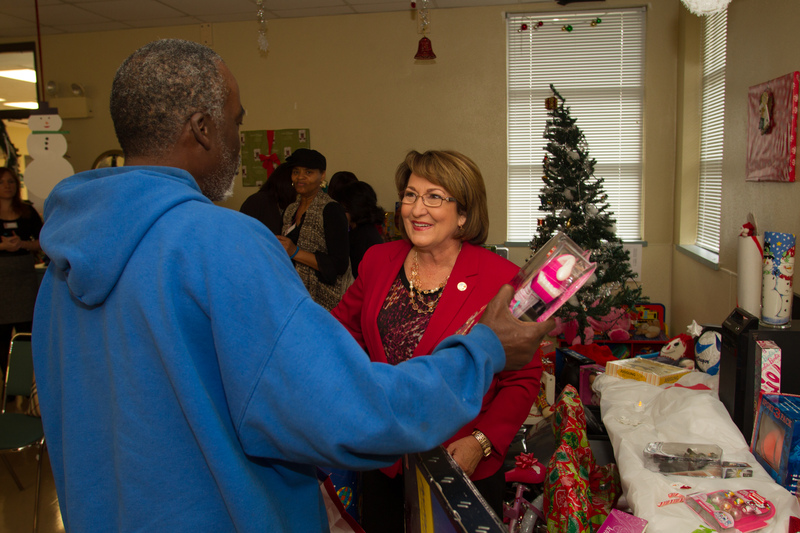 The Holiday Heroes Toy Drive wrapped up on Friday with local families selecting toys with the Mayor at the West Orange Neighborhood Center for Families in Winter Garden. At the annual toy shopping event, local families are able to personally select their toys of choice for their children. The Neighborhood Center for Families is a community-based collaborative of area public schools, government agencies, churches, grassroots organizations and nonprofit service providers that offer friendly assistance to the children and families of Orange County. Two very special families had the opportunity to select their toys with the help of Mayor Jacobs and each left with two large bags filled with games, dolls, basketballs and headsets in addition to a basketball hoop, two bikes and an electric Corvette. This year, Orange County Parks and Recreation was again the County division that collected the most toys with 1,650 toys and gift cards. In addition to Parks and Recreation, Fire Rescue, Utilities, Corrections, Family Services, Convention Center, Neighborhood Preservation and Revitalization, Environmental Protection, Planning, Human Resources, Regional History Center, County Administration, Communications, Permitting, Information Systems and Services, Code Enforcement and Animal Services collected toys to benefit Mayor Jacobs’ Holiday Heroes Toy Drive. FOX 35 was the official media partner for the toy drive, donating airtime and hosting Orange County’s signature annual Holiday at Heritage Square event at the Regional History Center. For the first time, Orange County partnered with the University of Central Florida (UCF) Student Athletes Association, Valencia College, and Light Up UCF at the CFE Arena. These extended collection efforts helped touch the lives of more children and families across our community. For the third year, Mayor Jacobs also kicked off her annual Adopt a Fire Station initiative. This program is a county-wide campaign that recognizes the efforts of the men and women of Orange County’s Fire Rescue Department. There were 28 stations adopted by 45 various organizations, families, businesses, and high schools. Many of the stations held open house for residents to visit and received a variety of creative care packages, including holiday meals, special decorations, and much more. A collection of photos from the Neighborhood Center for Families Toy Shopping event are available on Flickr for use by the media.